Wow, what a weekend! I cannot believe how much work goes into a first birthday party! AJ had the time of her life though. Grandma Amy & Aunt Marie were able to make the trip to visit (ie help) us and make the event even more memorable. Full post and highlights to come soon. What I wasn't prepared for was the amount of gifts that AJ would receive. Holy cow! My living room is one tall giraffe short of a toy store now! I'm going to have to spend some time this week going through everything and putting away some of the baby toys that she doesn't play with anymore. Among all the bustle of the weekend, I totally forgot that I had a delicious fudge pie in my fridge for our house guests! Drats... more sweets for me to eat! A lot of people will agree that a pie is as American as the flag itself, but I really consider October-January to be the perfect "pie season." Between Thanksgiving and Christmas, there really is no better time to chow down an apple, pumpkin, pecan or fudge pie to celebrate all the joy that the Holiday Season brings. Here's some fun ways to extend the pie fun even longer! The holidays are a great time for a child to practice tallying and counting. When dessert time comes around, ask your child to take a sheet of paper and to ask each individual at the gathering whether or not they would like a piece of pie. How many people said yes, compared to how many people said no? Help your child count up the results and count out the appropriate number of pie pieces before serving. He or she will be so proud to have been part of the process! By the way, curious how to get those perfectly sized pie slices? 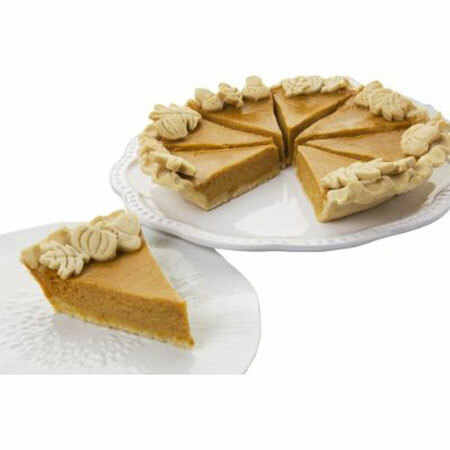 Check out this Slice Solutions Pie Pan Divider on Amazon for just $10.79! When it comes to "playing with your food," the folks over at Melissa and Doug are experts. For the younger set that won't be dishing out the real thing to Grandpa and Grandma, try this Make & Serve Apple Pie Set. In this set, the apples can be put together and sliced apart. A slice of apple fits inside each of the pie pieces! An adorable oven mit puts the icing on this set. Grandma and Grandpa will love this calorie free alternative from your little one! 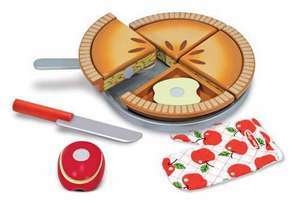 For older kids, the Make & Serve Apple Pie Set is a fantastic learning tool for exploring fractions! If I haven't gotten you hooked on Disney's Family Fun by now, this should do the trick! Check out this "Let's Make a Pie" feature of 25 amazingly delicious pies that have kid-friendly recipes. Don't forget to save a slice for me! Mmm, yummy pumpkin P as is pumpkin pie! I'm your new follower. Hope to see you in my My Monday Blog hop here. Mmmm..pie! I love pie and you are so right, this is the best time of year for it. I love the Melissa & Doug Make and Serve Apple Pie Set, so cute and fun!